We'd like to explain you about the name of Akita dog's body in this corner. Look at the figure at the lower left. There are many parts for example ears, eyes, head, back, hip, tail, nasal speculum, Sternum end, etc…. 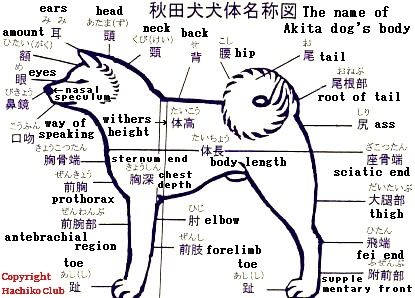 We feel it is a few who know all part's name even if the veteran Akita dog's owners. And there are some nicknames about the hair at the parts. By the way, there is the standard size for Akita dog. It was decided by "Akiho". �@Male's body length is 10% longer than against his withers height. �AFemale's body length is some longer than against her withers height. �BMale's withers height is Japanese say "2 syaku 2 sun" and female's withers height is "2 syaku". 1 syaku is 30.303cm and 1 sun is 3.0303cm. So Male's "2 syaku 2 sun" is 66.667cm and female's "2 syaku" is 60.606cm. It is their standard withers height for the Akita dog's contest. But it is a permissible range over or under 3.0303cm. �CThe chest depth's ratio is 50% against the withers height. 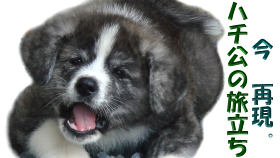 The Akita dog can't get the victory in the contest even if the Akita dog has good face. The Akita dog has to be blessed with the balance, color, scale and etc…. We hear sometimes ownner or judge's conversation," That Akita dog has good face. But…". If you and we are the amateur about Akita dog, It is Ok only feeling "So pretty!". But if the Akita dog will compete with to degree of perfection in the contest, the Akita sog desired the total balance. Look at above the 2 pictures. May be you feel the 2 Akita dogs are each different appearance. But the 2 pictures are same female Akita dog. She got the 1st place in Tohoku Hokkaido synthesis branch exhibition and special 1st place in northern Akita branch exhibition. Her parents both got the special 1st place in the Honbuten (in all of Japan) and her grand father got the Meiyo syou (winning in the king of kings) also in the Honbuten. we feel that she is little slim in the left's picture more than right's one. Left's one when she was young and right's one she reached prime of life. If an Akita dog is late bloomer, the Akita will increase the sense of stability brought in to overlaying the month. And the Akita dog's balance will not crumble. How do you think feel? May be you undestand it is the different from the sense of stability among left Akita dog and right one. It appears in some parts for example the thickness of chest and etc…. An veteran owner said us who made some Meiyo syou Akita,"There are many ownners who hope to get the victory with early in the contests. But it is rare that the Akita will continue to get the victory even if the Akita got the 1st place when it was young. 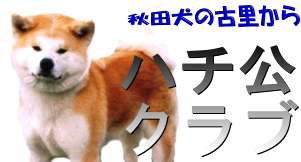 There is the true value in the stage of "Seiken" =grown dog=.If you hope to get the victory, you will have to build up the Akita dog carefully". You understand "late bloomer". Only the outstanding talent who elaborated carefully will leave his or her name in the history of Akita dog.